Today I am sharing one of my favourite stamp sets from the Spring/Summer catalogue with you. It's called Sheltering Tree and features this wonderful tree image, along with some lovely sentiments and additional small images which can be used to create a scene. The grass and the sky detail are both made with stamps featured in this set. 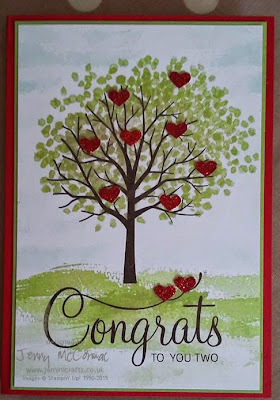 As you can see this card was made for an Anniversary, and I have used the tiny hearts from our Heart border punch to add into the tree instead of fruit or blossom! I am so pleased that this set is being carried forward to our brand new catalogue which launches next week. Not such good news for that lovely sentiment from Your Perfect Day, though it is available until 2nd June. To view items from the retiring list, please click on the right hand side of this website for more details, or click on the list below for items used in this card design.